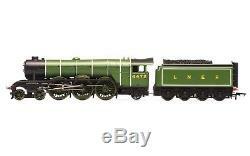 Hornby The Flying Scotsman OO Gauge DCC Ready Model Train Set R1167. 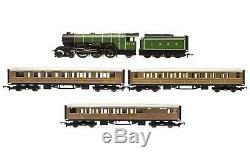 The most famous locomotive and train in the World features in this superb Hornby train set. The striking apple green liveried class A1 Flying Scotsman helps to recreate those wonderful days of train travel in the 1930s when the two great railway rivals, LNER and the LMS vied for the lucrative passenger traffic between London and Scotland. 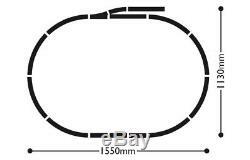 The track circuit in this set can be extended to fully complete the included MidiMat layout using additional track and accessory packs thus creating an exciting and fully functioning model railway. Additional coaches can be obtained to extend the train. LNER class A1 4-6-2 Flying Scotsman locomotive. 2 x LNER composite coach. 1 x LNER brake coach. Track pack A (with point and buffer stop). Hornby MidiMat (1600 x 1180mm). This item will be supplied with a US transformer. 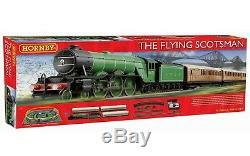 The item "Hornby The Flying Scotsman OO Gauge DCC Ready Model Train Set R1167" is in sale since Monday, September 24, 2018. This item is in the category "Toys & Hobbies\Model Railroads & Trains\OO Scale\Locomotives". The seller is "vrchobbies" and is located in Roslyn Heights, New York.